Reading the latest issue of Elvis The Man And His Music that arrived with the mail today, I was a bit disappointed to learn that FTD's vinyl version of Viva Las Vegas included two previously unreleased tracks. Although not mentioned in pre-release publicity, the LP edition features "The Lady Love Me" (take 2) as well as "If You Think I Don't Need You" (take 2). Apparently I'm not the only one who feels a bit cheated. Another reader who, just like me is a loyal supporter of the FTD CD's, a Mr Gary Thompson from Cambridge, calls it "cheap tactics to try and sell their over-priced vinyl." I have to agree, at least to a certain point. If you own the FTD CD version, that should be enough. You shouldn't have to buy an expensive vinyl album just to get two unreleased takes not found on the CD. Hey, many fans don't even own a record player. Speculating a bit, maybe the problem is that many of the soundtracks were released on just one CD in the classic album series, as opposed to the the non-soundtrack albums that came later on. As I discovered a while back, a lot of outtakes were missing on the FTD Kid Galahad CD, and this probably has to do with the limited space a one CD release offers. In all fairness, the Viva Las Vegas CD is packed with music, running for almost 79 minutes. But a look at the track listing reveals that a lot of takes seems to be missing here as well, as verified, at least to a certain point, by the two unreleased takes recently released on the LP edition. So isn't it a good thing that a couple of more outtakes are made available to the fans? Sure, but I for one still feel that the price to obtain them is to high. Why don't sell them individually on iTunes as well? That, I can afford. 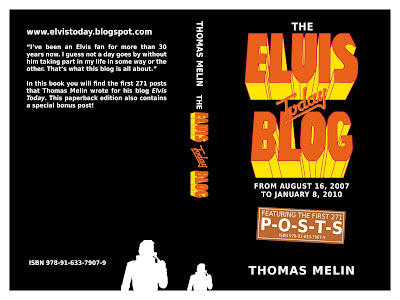 February hasn't been a very active one when it comes to new posts on the Elvis Today blog. With a four month old baby girl at home and a hectic time at work right now, I guess I can be forgiven. But as some of you have been wondering how my blog book is coming along, I thought I'd tell you that it's a bit delayed (what good Elvis products aren't?!) but should be finished in March. When Troy announced that The Mystery Train Elvis Blog would honor the 44th anniversary of 1967 with special features on that Elvis year all throughout 2011, I couldn’t keep my fingers away from the keyboard. Not only does 1967 mark the year I was born, it also saw the release of the soundtrack album Clambake. So I wrote a guest blog where I talk a little bit about the latter.